Learn More & Nourish Your Family with Confidence! You CAN help your child become a more adventurous eater WITHOUT pressure and battles at meals. This workshop will equip you with the knowledge and confidence you need to succeed. 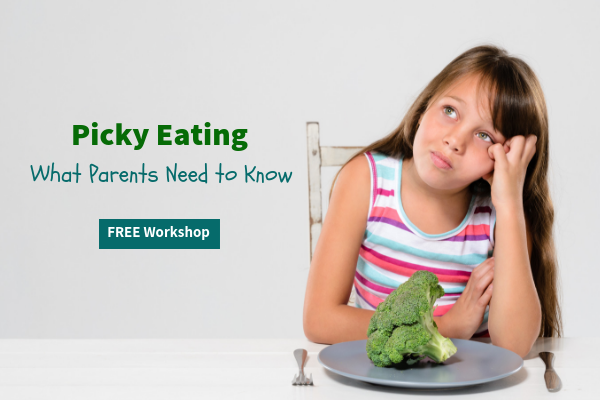 Learn essential feeding principles to reduce picky eating. Discover the keys to creating a positive meal time environment. 🌀Your child is so picky that you’ve given up the battle and find yourself making different meals for everyone. 🌀Meals are no longer joyful. 🌀You're frustrated by your child rejecting healthy meal choices and demanding unhealthy options. 🌀You want an approach that works for busy families and is rooted in science. With the right tools and knowledge, you can help your child become a more adventurous eater. Workshop Contents: 4 video lessons and a BONUS Picky Eating Survival Guide. Thank you! Please check your email for access to video lessons and guide.